Found in the heart of the city, the modern Hesperia Finisterre is a 5-star hotel overlooking the sea, and just a short walk from the Palexco Congress Center and A Coruña’s old town. Enjoy free access to the neighbouring sports centre, which has 3 pools, a gym, tennis courts and a spa, or just unwind with a drink on the terrace and treat yourself to international cuisine with sea views at the Novo Restaurant. Hesperia Finisterre's rooms offer free wi-fi, cable TV, minibars and private bathrooms. This landmark, glass-fronted hotel on the beachfront in La Coruna's historic and commercial center offers everything for events (capacity 650) & sauna, ocean views and a superb breakfast buffet. Elegant common areas with WiFi (extra charge) and concierge service 24h. All guestrooms feature wood floors, marble bathroom, English channels and room service 24h. Trueiro Restaurant offers fine-dining on international and Galician specialties. Enjoy a meal at the restaurant or snacks in the coffee shop/café. The hotel also offers room service (during limited hours). Wrap up your day with a drink at the bar/lounge. Buffet breakfasts are available daily from 7:30 AM to 11:00 AM for a fee. For lunch or dinner, stop by Attica, a restaurant that specializes in Spanish cuisine. Dining is also available at the coffee shop/café, and room service (during limited hours) is provided. Quench your thirst with your favorite drink at the bar/lounge. Buffet breakfasts are available daily for a fee. When you stay at AC Hotel A Coruña by Marriott in La Coruna, you'll be in a shopping district, a 4-minute drive from Coliseum da Coruna and 7 minutes from Marineda City. This 4-star hotel is 1.6 mi (2.6 km) from Hospital Universitario A Coruna and 1.9 mi (3 km) from Santa Cristina Beach. Enjoy a meal at _________________________, or stay in and take advantage of the hotel's room service (during limited hours). Wrap up your day with a drink at the bar/lounge. Buffet breakfasts are available daily from 7 AM to 10:30 AM for a fee. The Hostal Palas guest house is located in central A Coruña, just 50 metres from the main bus station. It offers spacious, heated rooms with a flat-screen satellite TV, free Wi-Fi and a private bathroom. The Hostal Palas is within 4 minutes’ walk of the Cuatro Caminos commercial area. La Coruña Train Station is just 8 minutes’ walk away. The Palas guest house has a 24-hour reception, and luggage storage. A good range of restaurants and bars can be found within a 5-minute walk. Regular airport buses leave from the bus stop located 50 metres away. Make yourself at home in one of the 45 guestrooms, featuring kitchens with full-sized refrigerators/freezers and microwaves. Complimentary wireless Internet access keeps you connected, and 22-inch LCD televisions are provided for your entertainment. Conveniences include phones, as well as desks and coffee/tea makers. Make yourself at home in one of the 131 air-conditioned rooms featuring minibars and flat-screen televisions. Complimentary wired and wireless Internet access keeps you connected, and satellite programming provides entertainment. Private bathrooms with bathtubs feature complimentary toiletries and hair dryers. Conveniences include phones, as well as safes and desks. The hotel is located 2 km from The Port of Corunna, 2.5 km from Maria Pita Square and 3 km from Riazor Stadium. Facilities and services include a 24 hrs reception, restaurant, snack bar, elevator, wired Internet in public areas, safe box at reception, meeting room and parking (extra charge). The rooms are equipped with air conditioning, TV, telephone, wired Internet and hairdryer. Address: Calle de Ramón y Cajal, 47, 15006, Corunna, Spain. Apartments hc has 28 spacious apartments, single, double or triple. They have a living room, bathroom and one or two bedrooms. Also the apartments have a kitchen, with the basic utensils to heat food already prepared, not being able to cook large plates, it has a microwave and mini-fridge. We offer free wifi to our customers. Our location is close to the center of La Coruña, Cuatro caminos and the Riazor stadium (by bus or car), we are close to the airport and nearby industrial estates. We accept small domestic pets. NOTICE: American express is NOT accepted. Hotel Mar del Plata is located in central A Coruña. It offers rooms with free WiFi access and a flat-screen TV. Featuring a bath or shower, private bathrooms also come with free toiletries. You can enjoy sea view from some rooms. At Hotel Mar del Plata you will find a 24-hour front desk and a bar. Other facilities offered at the property include a shared lounge, a tour desk and luggage storage. 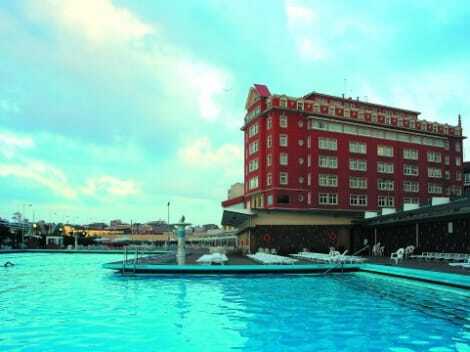 The hotel is just a stone's throw from Deportivo La Coruña's legendary Riazor stadium. Riazor Beach is also just 100 metres away. lastminute.com has a fantastic range of hotels in La Coruna, with everything from cheap hotels to luxurious five star accommodation available. We like to live up to our last minute name so remember you can book any one of our excellent La Coruna hotels up until midnight and stay the same night.